Douglas Quijano's talents sing Florante's "Handog," which they dedicate to their late "father" in the showbiz industry. The late talent manager Douglas Quijano was given a send-off party by his talents last night, July 23, at Club Filipino in Greenhills, San Juan City. Last night was the 40th day after Quijano's death, which Catholics believe is the last day on earth of a departed person's soul. 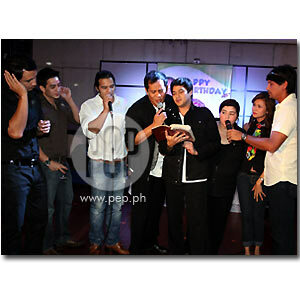 The party was also a celebration of what would have been the well-loved talent manager's 65th birthday on July 24. "Magsasaya tayo ngayong gabi!" proclaimed one guest. True enough, this was the mood of the party throughout the night. "Dougs is a happy person, 'no? Gusto niya lagi na masaya ang mga nakapaligid sa kanya," Richard Gomez said in a short chat with PEP (Philippine Entertainment Portal). The multi-awarded actor added, "This is how we want to remember Douglas, and this is our way of celebrating his life. Since this is the 40th day since he died, and in a while, it could be his birthday, we want everybody to be happy." Celebrities, talent managers, TV executives, and a select group of entertainment writers attended the 40th day of prayer for Douglas, who is better known in the showbiz industry as Tito Dougs. As Richard put it, "Parang ito ang huling pugay para kay Dougs." The talents of Douglas who attended the party were Joey Marquez, John Estrada who came with his girlfriend Priscilla Meirelles, sisters Janice and Gelli de Belen, Wendell Ramos, brothers Antonio and Jay Aquitania, Jomari Yllana, and Anjo Yllana, who came with his wife Jackie Manzano. PEP also spotted former actress Giselle Tongi-Walters, who now lives in Los Angeles, California. Lucy Torres-Gomez, wife of Richard and also a talent of Tito Dougs, was in Ormoc City for a reunion. Douglas's colleagues also came to celebrate with his family. Among them were Professional Artists Management Inc. head June Torrejon, Dolor Guevarra, Shirley Kuan, Ethel Ramos, and Lolit Solis. Close friends of the talent manager, writer Ces Evangelista, talent manager Neil de Guia, and events organizer Marilen Nuñez were also at the event last night. ABS-CBN Senior Vice President Cory Vidanes, GMA-7 Program Manager Redgie Magno, and Television and Production Exponents (TAPE) Inc. Senior Vice President and COO Malou Choa-Fagar also came to celebrate with Douglas's talents. "Masaya kasi nagkita-kita ulit kami kahit kulang. Pero, as always expected naman 'yan, basta alam namin na magkikita-kita kami," said Nadia Montenegro in a separate interview with PEP. KEEPING THE FRIENDSHIP. At midnight, Douglas's talents recalled how they were able to enter showbiz with his help. Joey, who was the oldest and tagged as Douglas's favorite by his "mga kapatid," narrated how Douglas consulted him about his then newfound talents—Richard, John, Anjo, and Jomari, and Nadia—all of whom seemed unfit for stardom, according to Joey. This elicited a lot of lauging and hooting among the stars. Gelli de Belen recalled how her late talent manager helped her cope with a heartbreak when she was not yet married to Ariel Rivera. "Sinasama niya ako sa lahat ng meetings niya. Ginawa niya lahat para mapasaya ako," said Gelli. After the recollections, everyone sang Florante's song "Handog," which was dedicated to Tito Dougs. His family and talents offered white roses by his urn, which was placed in front of a big tarpaulin that had his picture with a "Happy Birthday" greeting. Now that their father in the industry has gone, Tito Dougs's talents are moving on their own. Some are now in the care of their new talent managers, while others are still deciding whom to trust with their showbiz careers. Wendell Ramos is now with Wyngard Tracy, while John Estrada may follow suit. Janice de Belen is now with Popoy Caritativo. Janice's sister Gelli is now with Boy Abunda, who is also the manager of her husband Ariel Rivera. Despite this, both Richard and Nadia agreed wholeheartedly that they would do their best to keep the bond that began for them through Douglas. Richard Gomez—actor, TV host, athlete, and budding politician—said, "The friendship will always be there. Hindi mawawala 'yon kahit magkahiwalay kami ng managers. You know, we've built this friendship for more than two decades na." For her part, Nadia said that everyone respects each other's decision to find a new talent manager or wait until the others have chosen a new one. She explained, "From the beginning naman, unang-unang meeting pa lang namin, sinabi na namin na kapag nag-decide ang bawat isa, lahat rerespetuhin 'yon. But if we can stay as a family forever, we will. So, walang makakapagpabago ng pagkakapatid namin."